MINNEAPOLIS—July 31, 2012—In a positive sign for consumer access to credit, FICO’s quarterly survey of U.S. bank risk professionals found that lenders expected the supply of credit to satisfy demand for all types of consumer loans through the end of 2012. This is a change from last quarter when survey respondents expected the supply of credit for residential mortgages to fall short of demand. The latest survey, conducted for FICO Labs by the Professional Risk Managers’ International Association, also found that lenders expected an increase in the amount of credit extended to consumers, potentially injecting more spending power into the economy. 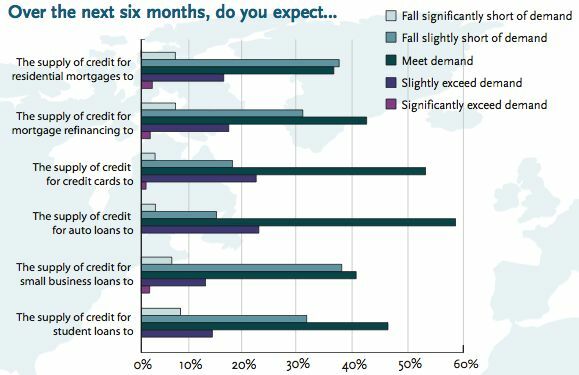 When asked whether credit supply for several different types of consumer loans would meet demand over the next six months, survey respondents overwhelmingly said yes. For credit cards, 77 percent of respondents expected supply to meet or exceed demand. For car loans, the figure was 82 percent. Regarding residential mortgages, 55 percent of respondents expected supply to meet demand. For small business loans, 56 percent said there would be an adequate supply, and for student loans, 61 percent felt that supply would satisfy demand. Survey respondents also said lenders will expand their credit approvals. More than 35 percent of survey respondents expected the approval rate for consumer credit applications to increase over the next six months. By comparison, just 19 percent said the approval rate for credit applications will decline. Moreover, 45 percent of bankers surveyed expected the total amount of consumer credit extended by lenders to increase during the next two quarters, nearly triple the percentage of respondents who expected a decrease.